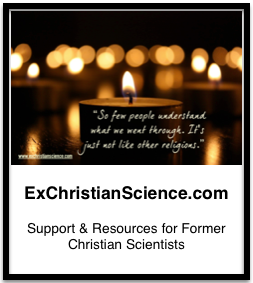 This is part of a series of posts exploring the questions of Is Christian Science Christian? Not Christian? A Cult? All posts will be tagged Christian or Cult? I’ve heard (and read) quite a few critiques of Christian Science “not really being Christian” (see links below – 1) but I never really bothered with it the idea – after all the Tenets of Christian Science (2) say we “acknowledge Jesus” and that was usually enough to keep my other-denominational friends from pestering me too much, the rest of the details are just icing on the cake. In many ways, the Apostle’s Creed feels much more solid than the Tenants of Christian Science. The statements are very solid, many starting with “I believe” making it all the more personal. The Apostles’ Creed is a stark contrast to the Tenets of Christian Science and a far more literal system of belief is established. Before we delve into the Tenets, it is important to know how Ms. Eddy defines Christ (S&H p. 583) and Jesus (S&H p. 589). (Tenet 4) We acknowledge Jesus’ atonement as the evidence of divine, efficacious Love, unfolding man’s unity with God through Christ Jesus the Way-shower; and we acknowledge that man is saved through Christ, through Truth, Life, and Love as demonstrated by the Galilean Prophet in healing the sick and overcoming sin and death. (Tenet 5) We acknowledge that the crucifixion of Jesus and his resurrection served to uplift faith to understand eternal Life, even the allness of Soul, Spirit, and the nothingness of matter. Sunday School students are taught they make their own hell when they disobey/stray from their ever-loving God, but I am unclear of Christian Science’s official view on judgement after death. While Ms. Eddy did see fit to include Probation After Death and Everlasting Punishment as official weekly Bible Lesson topics, the heart of the issue is glossed over in Sunday School. My father once explained that we have to work out our own salvation, if not in this life, then then next, and eventually we would be one with God, but I’m unsure if that is official Christian Science dogma, his own personal view. While the Tenets of Christian Science are often enough to dissuade an over-eager Christian from attempting to “convert” they fail stand on their own as “Christian” in the traditional sense. The Apostles’ Creed is far more straight forward, and while there is plenty of room to interpret them and argue the finer points, they are clearly applicable and accepted by most of Western Christianity. A complex system of reality, unreality, heaven, hell, mortal mind, and salvation, is only useful if you’re the person controlling it as a way to keep the others in line. The entire system is confusing and complicated, we should all be nice to each other and do away with antiquated systems of belief which have been used for centuries to oppress. I’m unclear how the Christ idea could come to the flesh, as MBE defines it on p. 58 it is unreal: FLESH. An error of physical belief; a supposition that life, substance, and intelligence are in matter; an illusion; a belief that matter has sensation. *An open letter to followers of the Christian Science movement contends that MBE took ideas from Hinduism, and the ideas they discuss also echo some of Hegel’s views as well.